In today’s retail environment, shoppers can buy in many ways — online, in‐store or via mobile — and then receive their purchases when, where and how they’d like. The shopper’s experience across all these channels can be a retailer’s major differentiator. The new Motorola CC5000 customer concierge caters to customers’ every need through an interactive platform, which can be configured to allow customers to look up product information, make purchases, receive special offers and instantly connect to the right person via voice or video. The CC5000 allows you to create an electronic customer concierge that can cater to your customers’ every self-service need. 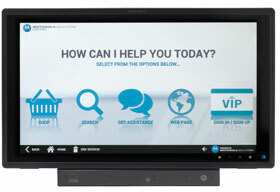 Instead of the typical kiosk, the CC5000 is a rich interactive platform that can be configured to allow customers to look up product information, make purchases, pair their smartphone to the CC5000 to receive special offers and instantly connect to the right person via voice or video to answer any question. A true ‘dream machine’, the CC5000 can provide shoppers in a retail store, guests in a hotel and travelers with the concierge-style service they dream of, while helping you strengthen customer relationships, improve customer loyalty and satisfaction — and increase sales.